This example plots the ellipsoids obtained from a toy dataset (mixture of three Gaussians) fitted by the BayesianGaussianMixture class models with a Dirichlet distribution prior (weight_concentration_prior_type='dirichlet_distribution') and a Dirichlet process prior (weight_concentration_prior_type='dirichlet_process'). On each figure, we plot the results for three different values of the weight concentration prior. The BayesianGaussianMixture class can adapt its number of mixture components automatically. The parameter weight_concentration_prior has a direct link with the resulting number of components with non-zero weights. Specifying a low value for the concentration prior will make the model put most of the weight on few components set the remaining components weights very close to zero. High values of the concentration prior will allow a larger number of components to be active in the mixture. The Dirichlet process prior allows to define an infinite number of components and automatically selects the correct number of components: it activates a component only if it is necessary. 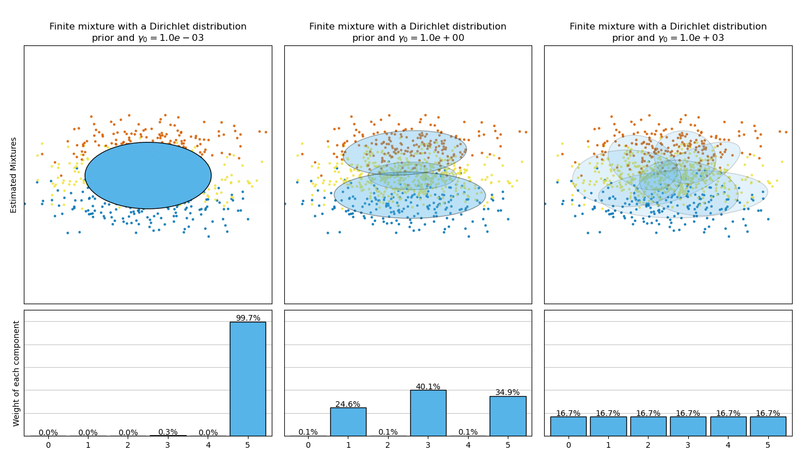 On the contrary the classical finite mixture model with a Dirichlet distribution prior will favor more uniformly weighted components and therefore tends to divide natural clusters into unnecessary sub-components. ("Finite mixture with a Dirichlet distribution\nprior and "